Some supporters of the cause! 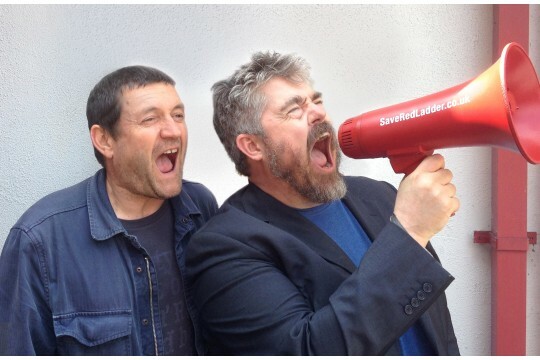 On 1 July 2014 it was announced that Red Ladder is to lose 100% of its Arts Council funding, as part of the government's austerity cuts.The Save Red Ladder campaign was set up in response to this and to date the campaign has raised just over £30,000. This money has allowed Red Ladder to match fund for further funding and has kept it afloat for the time being. Red Ladder makes theatre that represents the dispossessed, tells stories of the injustices of our world and changes the lives of the people we work with. We work with and support emerging writers and directors, touring new writing nationally as well as creating big community shows in Leeds. We also run a free actor training scheme called Red Grit, and a writers group, Red Writers.